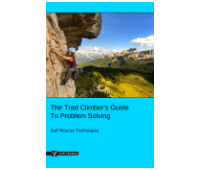 This article about the sliding-X knot is part of the e-book - The Trad Climber's Guide To Problem Solving. 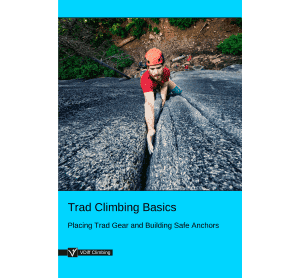 The main advantage of using a self-equalizing anchor is that it distributes the load equally between the anchor pieces. This puts less force on each piece, therefore decreasing the likelihood of anchor point failure. 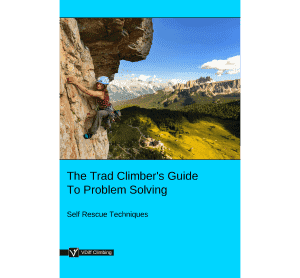 The main disadvantage is that if one piece fails, the whole belay shifts. This shift is barely noticeable on a well set up anchor. 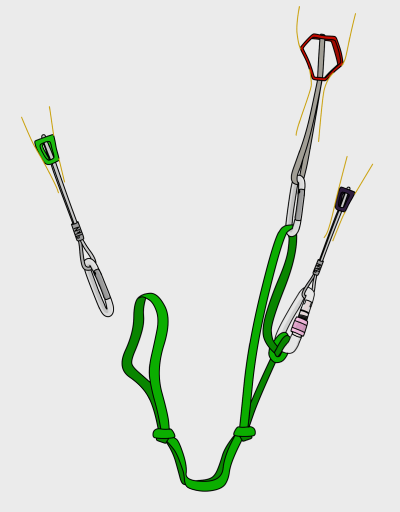 However, with some setups, the sudden jolt could cause you to lose control of your belay device. 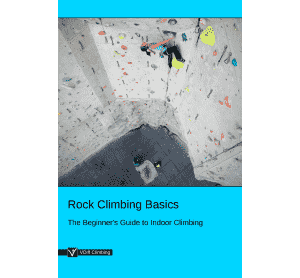 Be careful where you use self-equalizing anchors and make sure to tie appropriate extension-limiting knots to reduce the possible sudden shift in belay position. 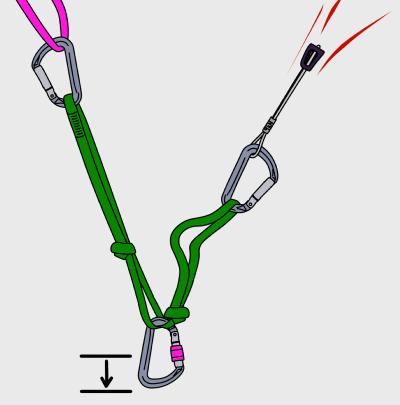 Complicated belays don’t need to use up huge amounts of slings or rope. 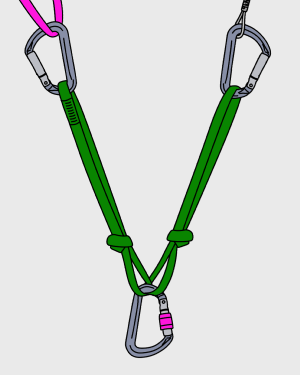 The techniques shown in this section require only a sling or two and some carabiners for constructing 3, 4 or 5 point belays. 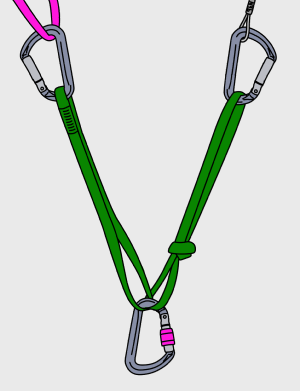 Clip a sling through two pieces of gear. Make sure the sewn section of the sling is near the top of one of the pieces so it doesn’t interfere with the sliding-X knot. Twist the sling 180 degrees and then attach a carabiner to it. The central point will now be equalized even when the pull comes from different directions. Position the central point where you want it. 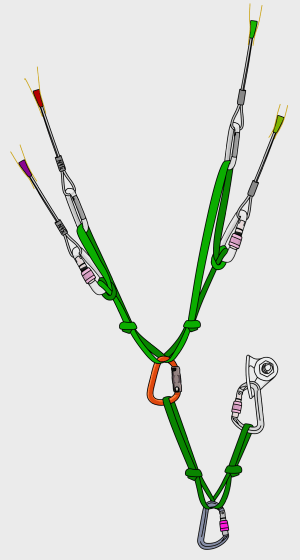 Unclip the sling from one piece and tie an overhand knot near to the central point. 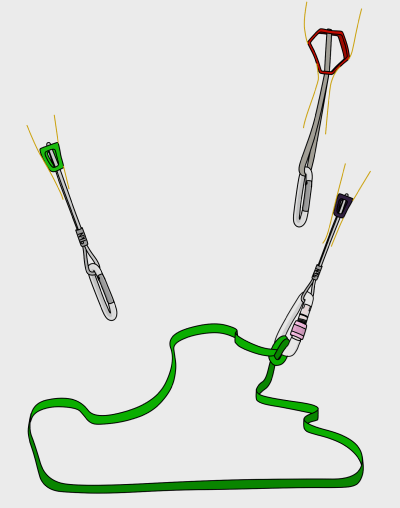 This is known as an extension-limiting knot. 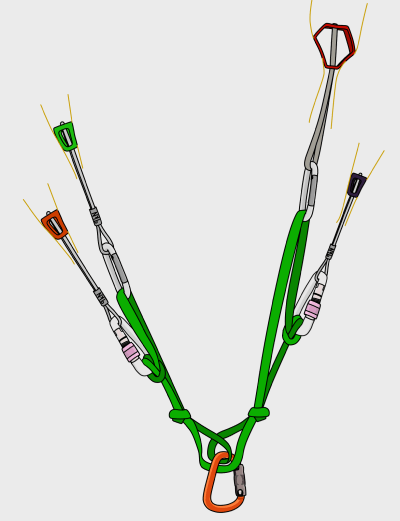 The closer to the central point you tie them, the less the anchor will extend if one piece fails. Clip the sling back into the piece. Repeat steps 3 and 4 with the other side. You can now adjust the overhand knots so they are as far down as possible while still allowing the central point to move freely where it needs to. If one piece fails, the central point will shift as shown. 1) It’s essential that you twist the sling in step 2. If you don’t, the central point can become completely detached from the anchor if one piece fails. 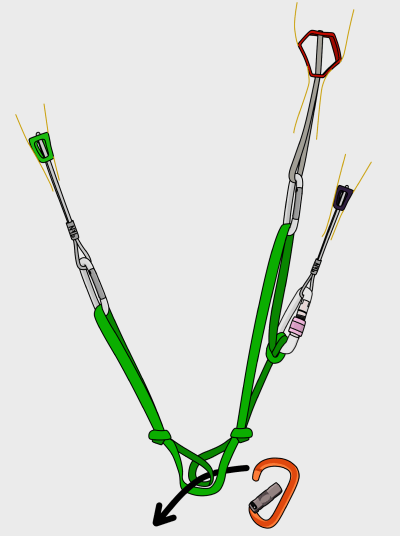 2) It can be difficult to clip another carabiner into the main point of a sliding-X when it is weighted. 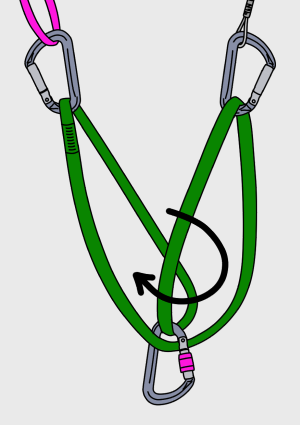 If you must do so, make sure you have clipped the carabiner through the sling in exactly the same way as the original carabiner. 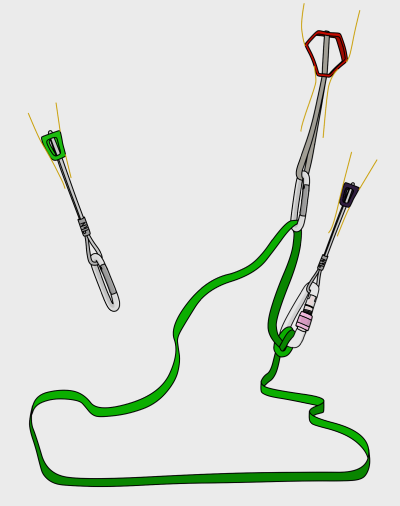 A much better alternative is to use the quad anchor. The following arrangement uses one double-length sling to equalize three pieces. Clovehitch a double-length sling to the lower right piece. Clip the sling through the upper right piece. Clip the sling into the left piece. Adjust the knots so they limit extension while allowing for some directional movement. Put a 180 degree twist in one of the master point strands and clip a carabiner through both loops as shown. You could also equalize four pieces by clovehitching another piece on the left. 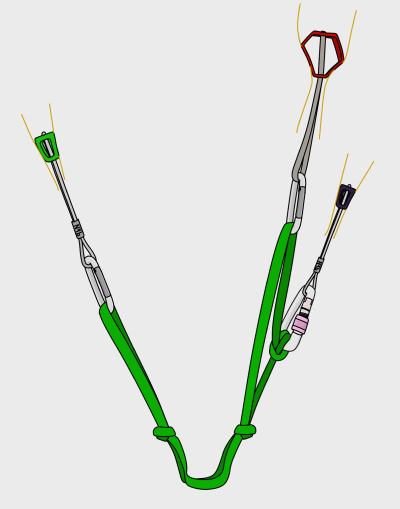 You may need to adjust the extension-limiting knots after adding the fourth piece. 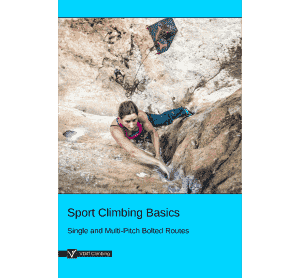 If your belay consists of one bomber piece (the bolt) and four mediocre pieces (the micro nuts), you could use an arrangement like this. This method equalizes the pieces so the bolt takes 50% of the load and the four micro nuts take 12.5% each.